Stephen Colbert's "Late Show" may have aired from New York City Monday night, but its heart was in Paris. 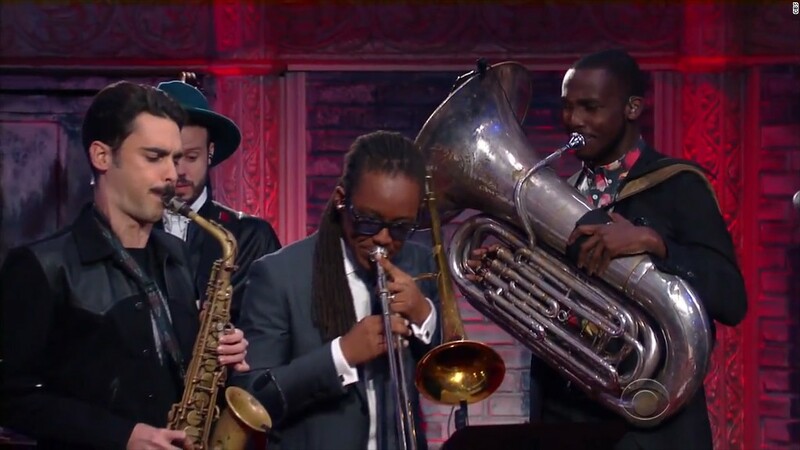 CBS's "Late Show" opened Monday's show with house band "Jon Batiste & Stay Human" performing the French National Anthem to a standing and silent audience. Even Colbert's opening credits showcased Parisian landmarks rather than the usual ones from New York. "New York is a city that sadly knows too well the horror the French experienced on Friday," Colbert said from his desk at the start of the show. "And we also know there are no words that can reach the depth of their grief and their shock. But we stand with the people of France as a friend and an ally, and offer the hope that there is a way through the unspeakable tragedy." Colbert went on to thank France for what they've given to America over the years from "aid to General Washington" to the host's "favorite way of kissing." He also thanked France for giving the country its "enduring symbol of freedom" in the Statue of Liberty. "In a tribute to its mother country, Lady Liberty offered ISIS a fitting gesture," Colbert said as a picture of the Statue of Liberty giving a blurred middle finger came on screen. "Long may it wave." It was Colbert's second gesture in support of Paris, having made a somber closing to his show on Friday as well. Colbert wasn't alone with tributes to France on Monday night. "Late Night" host Seth Meyers, "Daily Show" host Trevor Noah," and "Tonight Show" host Jimmy Fallon all mentioned the attacks on their broadcasts. "We are different people than we were at 4 o' clock last Friday," Fallon said. "Those shootings and bombings were set out to destroy us, and destroy humanity, but guess what? It backfired. Because instead those events brought us even closer together."